One of the wonderful opportunities a storyteller has, is to explore getting ‘inside’ a vast array of characters and embodying them. Becoming different characters is enormous fun, but also very instructive. In the creative process of discovering what any character might be like physically, vocally or imaginatively, you can’t help learning things about yourself and about humanity in general. Getting under the skin of characters offers the opportunity to find out how they tick, in a very intimate way. I admit I enjoy being ferocious monsters, wily crones and muscular warriors just as much as beautiful queens and wise kings. In a way, I am keeping alive a skill of imaginative play many people offload when the think they are too grown up for it. Drawing is an important part of my creative process. I often sit down to draw without deciding what I want to draw and just scratch about until something emerges. 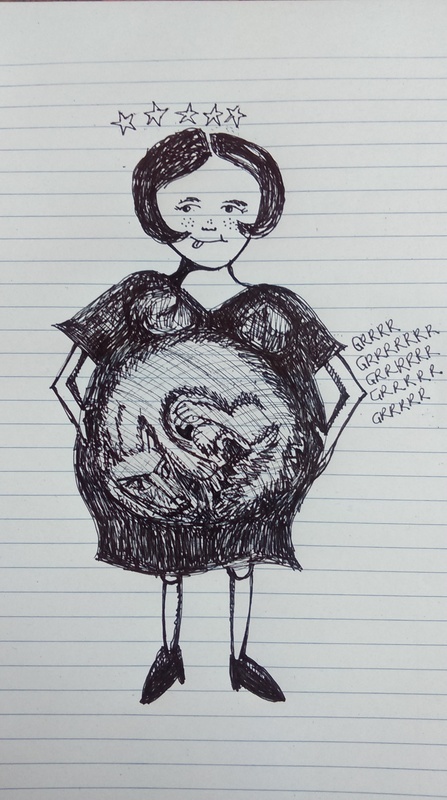 It is a thing of wonder to be surprised by your own drawings! It’s always fascinating to discover what is lurking in my unconscious, especially since this is one time it happens when I am awake, rather than in my dreams. These two lovely sisters showed up this morning and I am more than sure they have many stories to tell. Since I was a teenager, I have wanted to write and illustrate books for children. Slowly I am inching my way down a path to the place where this dream will come true! 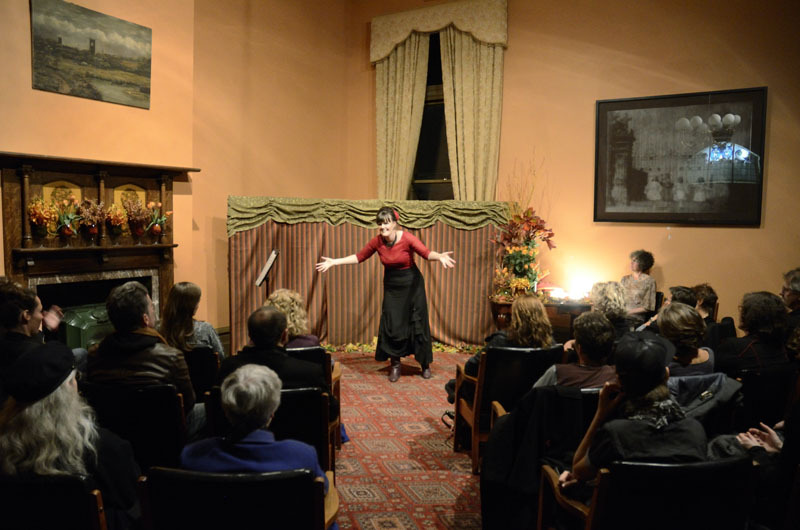 Warmest thanks to all who came out to Newport recently for my Storytelling House Concert. As you know, the event was a fund-raiser, with ticket sales going toward my upcoming trip to Ireland. It was evident that you donated more than the set ticket price, which was very generous. I wanted to let you know that the funds raised from this event have just paid for a week’s accommodation in Dublin. I’m very grateful for your support! This will enable me to have a week in Dublin’s fair city at the end of my travels, to do some final research and some writing, before I return to Australia. The trip planning began with an invitation to tell stories at Sneem Storytelling Festival, but there now seems to be an ever increasing list of opportunities for storytelling and story listening, which I will blog here, as I go. Looking forward to sharing my adventure with you! Investigating the Wise Women and Seanchaí of Ireland. Peig Sayes – Irish seanachie. 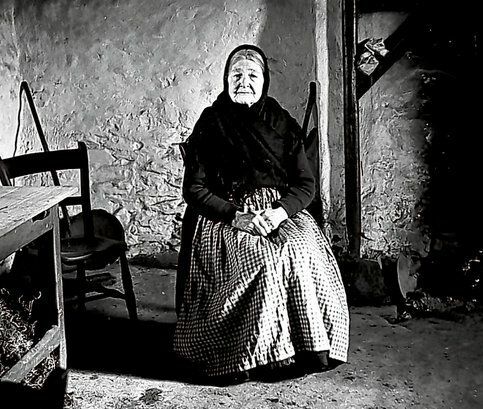 Being in Ireland will be a great opportunity to do some research on Irish stories and Irish storytellers – the seanchaí and wise women, keepers of the oral tradition. I must look up Peig Sayer’s writing and folk stories, as I have only dipped into a few, in a collection I bought when I was last on the West Coast of Ireland, in 2008. 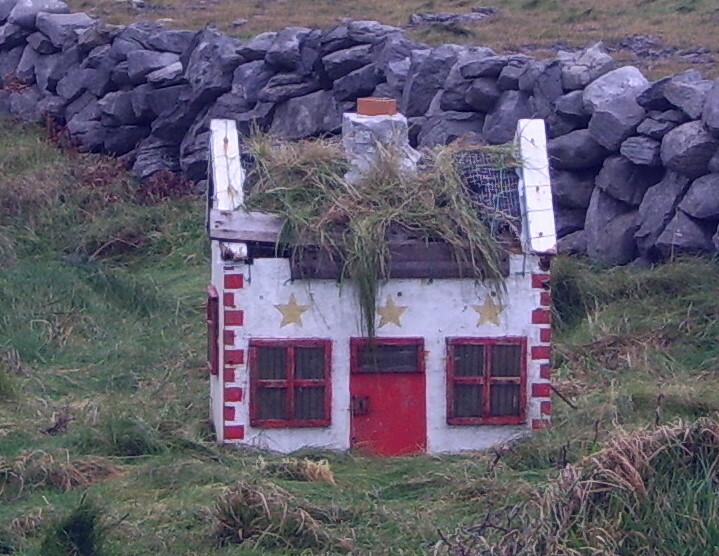 Peig lived on the beautiful, rugged and challenging Blasket Islands, off the coast of Kerry, Ireland. She made a great contribution to Irish folklore, but did not write her stories down, as she was a keeper of the oral tradition. These storytellers and their stories fascinate me. There are many stories I tell that I have never written down or recorded, but nothing like what these men and women would have committed to memory! So much culture, tradition, knowledge of place and people was kept for generations in these stories. It’s only 40 days until I fly to Ireland to begin my storyteller’s tour. There is so much to do before I take off and I have several lists on the go, trying to make sure that I have done all I need to do before take-off, as well as setting up my itinerary as much as I can, without shutting down the spirit of adventure! All this began with a simple question, “Might you be in Ireland this November?” This was followed by an invitation to be a guest storyteller at Sneem Storytelling Festival. From this several other concerts have sprouted and many opportunities for study and research. Best of all there are so many wonderful people to meet, many of whom I have been talking to online from this side of the planet for several years. A couple of them have written books I have devoured. I can’t wait to meet them all in person! 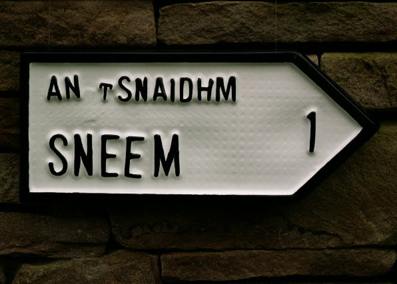 I think the road to Sneem Storytelling Festival might just be lined with cups of tea and a few pints of Guinness. Grand review for Epic Tales. In 2014, Tremaine Pavlovski from Scotch College, Melbourne, commissioned me to write a show about my ancestors and their experience of migrating to Australia and how this had impacted my own story. The result was ‘Kissing the Blarney As It Flies’, which was performed initially for Tremaine’s Grade 5 class, who were exploring the histories of their own families and responding to them with dramatic works, centred on their own storytelling. Skilfully led by Tremaine, the boys’ work was highly successful; the images, 3-dimensional artworks and installations they created were spectacular. 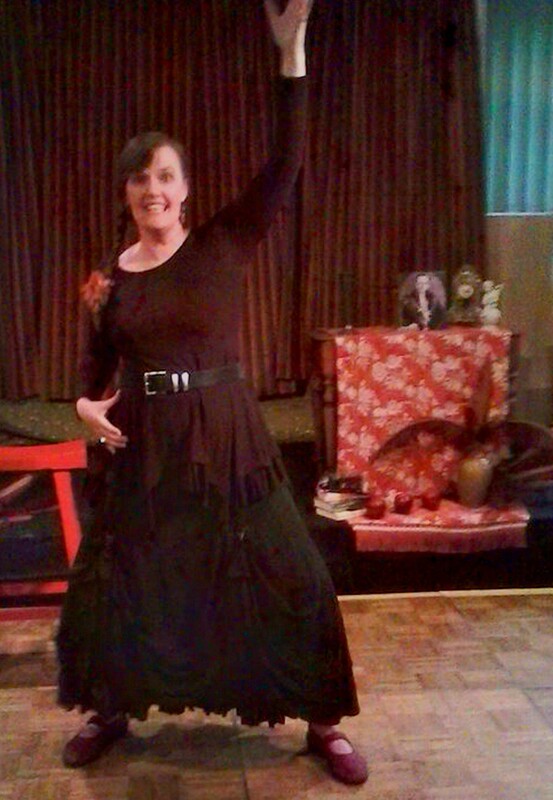 Later that year I presented this first show about my Irish ancestors as part of the ‘Words On The Wind’ series of storytelling events, at the Library At The Docks, in Docklands, Melbourne. This was a wonderful series of storytelling events, curated by Storytelling Australia Victoria, which explored associations with the Docklands from many different perspectives. My ancestors Peter and Margaret Walsh sailed into Hobson’s Bay in the late 1800s, aboard ‘The Red Jacket’, having left Waterford, Ireland to make a new home here. Dr. Frances Devlin-Glass, the Director of Bloomsday in Melbourne, saw the show at the Docks and we began discussing the possibility of a storytelling show at the Celtic Club, as a fund-raiser for Bloomsday in 2015. Frances said her audience would appreciate some humour, perhaps some material drawn from The Tain and to be sure I added lashings of hyperbole. I relished the challenge and the prompting to get some of the epic legends of the Irish Fenian and Ulster Cycles under my belt. Reading several different versions of the stories, including Thomas Kinsella’s translation of The Tain, I started to develop material that could be delivered as an oral storytelling performance. Deirdre Gillespie generously gave me some coaching on my Irish pronunciation of the names of characters, places and landmarks, for which I was very grateful. Throughout the process, I also researched more of the history of my own Irish ancestors and began to weave their stories around the legends and folklore, to bind them all together. 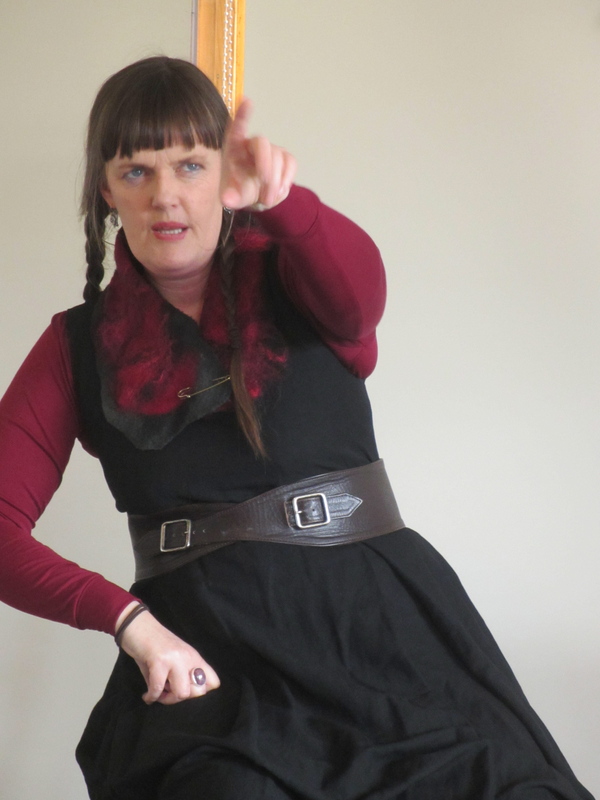 Out of this process of research, reflection and improvisation, grew ‘Dancing the Bones of Irish Myth and Legend’, which was presented initially at the Celtic Club, with great success. Grab your diaries now and make sure you book soon to enjoy this amazing performance of stories, drawn from folklore, myth and legend. Tickets $25 per person. Di and Stuart, of Countrywide Cottages are hosting an afternoon of storytelling by their friend, Niki na Meadhra. 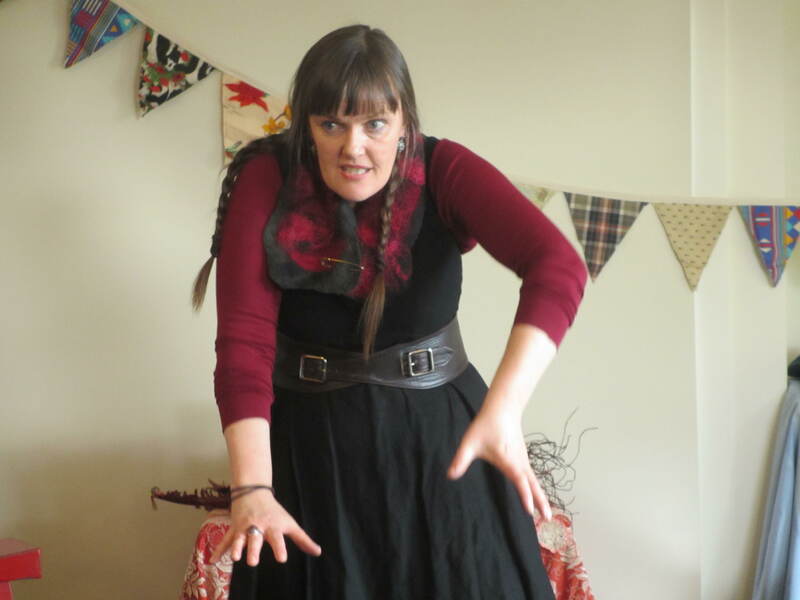 Niki has worked as a theatre practitioner, storyteller and community artist in a broad range of settings for over 30 years. She has told stories to audiences ranging from intimate garden parties to 3000 people at Dallas Brooks Hall. 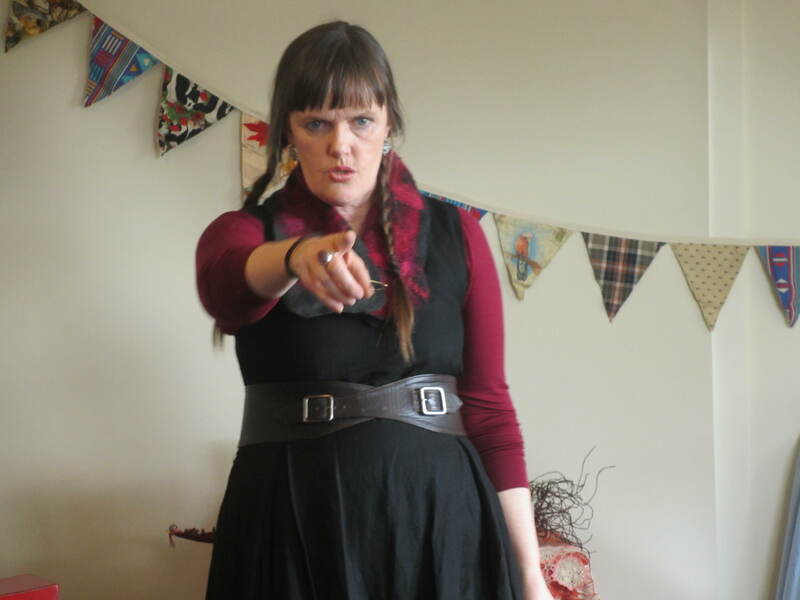 This year Niki has been invited to tell stories in Ireland, at the Sneem International Storytelling Festival, in Kerry. This has grown into a tour, including concerts in Cork, and Waterford. When Niki was last in Ireland in 2008, she kissed the Blarney Stone and hasn’t been able to stop telling stories since! 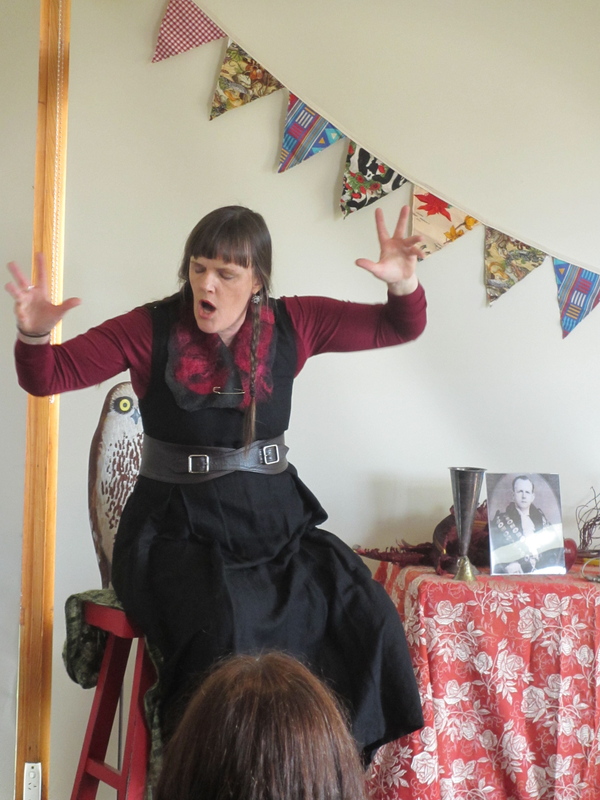 She has a passion to fan the flames of the oral tradition and would love to seed storytelling events and foster storytelling skills in communities wherever she travels! There are limited tickets for this magical event. 100% of the proceeds will go to Niki to help her extend her storytelling tour of Ireland. Dinny Goonan will be selling his amazing wine; afternoon tea will be provided and there will be a raffle of some lovely local goods. If tickets are sold out when you try to book, please leave your details on the waiting list or be in touch with Di and Stuart, as they then plan to arrange a second gig the following afternoon. Niki na Meadhra becoming the hound of Culainn, reading to attack the young Setanta. Setanta spies the hound in the shadows. It was a joy to tell stories of ancient Ireland and weave them together with stories of my own Irish ancestors, at my recent House Concert in Newport. First the audience was introduced to my grandfather, Tom Walsh, a man of great charm and a lover of literature, to whom the first story of Fionn MacCumhaill (Finn McCool) was dedicated. The second series of three shorter stories about the Cailleach, the Irish crone/goddess, were dedicated to my feisty great-grandmother, Florence. After some chai and afternoon tea we regathered and I launched into the grand tale of the childhood deeds of Cú Chulainn. This story was dedicated to my great-great-great-great-grandmother, Kitty McCann, of Belfast, because she and Cú Chulainn both hailed from Ulster. I suspect that I have a little of Kitty’s spirit in me, because one of my favourite things to do is become the warrior, Cú Chulainn, when he goes into ‘Warp Spasm’ – a frightening state that overcomes him, when he goes into battle. (Though Kitty never took up a sword, she faced major obstacles in her life with enormous courage, beginning with migrating from Ireland to Australia, aged 16, alone.) A ‘Warp Spasm’ is quite tiring and I really did enjoy that cup of tea when the stories ended. Warmest thanks to my host, Jackie Kerin, for generously opening her home for this event and making everyone so welcome and comfortable. Jackie is a wonderful storyteller herself and the current president of Storytelling Australia Victoria. 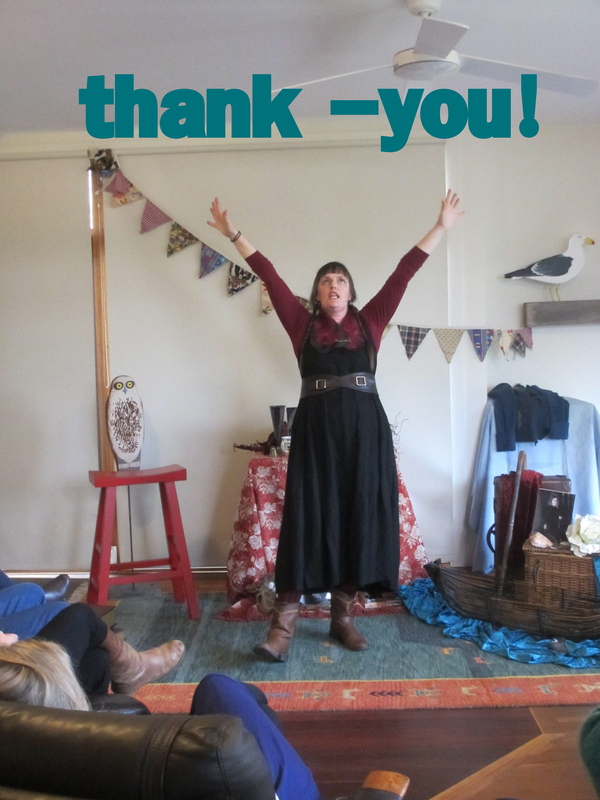 She is a great champion for storytelling and storytellers and has been a great supporter of my practice. Thanks also for my wonderful audience, who came out for some stories and generously supported this fund-raiser, to help make my upcoming trip to Ireland possible. Thanks for joining me in the stories and all your feedback and suggestions afterwards. 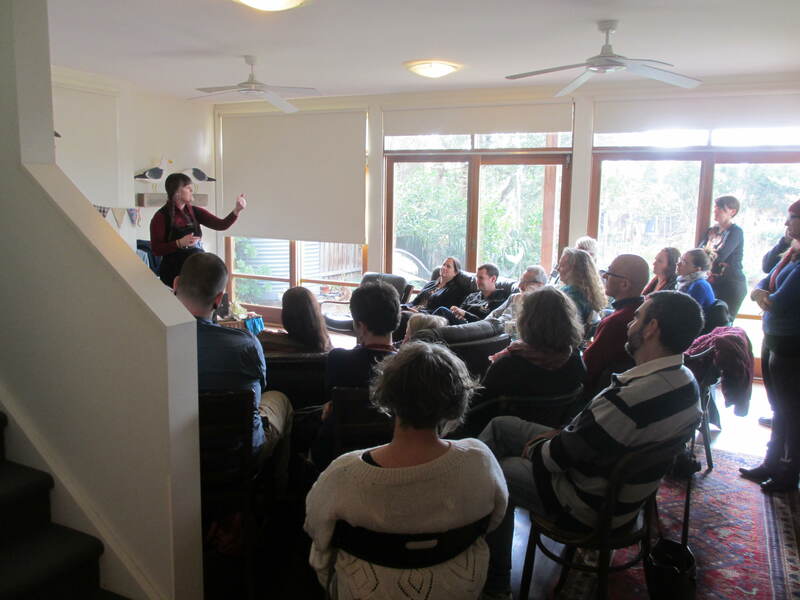 A House Concert: A wonderful place to tell & hear stories. Niki na Meadhra @ Newport House Concert, August, 2015. In a few short weeks, I will again have the luxury of telling stories at a House Concert. This time my hosts will be Di and Stuart from Countrywide Cottages, Bambra. They have been very busy letting the local community know that I will be heading down from the Big Smoke to tell a yarn or two. From all I have heard from Di, it sounds like I will be made very welcome by some generous country hospitality. Telling stories at a House Concert is very intimate and makes me think of days gone by, before television and the internet, when people often gathered in pubs, or homes, around a fire to hear a story. For the audience, the cosy comfort of being in someone’s home adds to the magic unfolding, by giving them a relaxing environment to let go of the wider world and tune in to the world of the stories. For me, as a storyteller, it feels very personal and immediate to be able to see the face of each listener and to ask direct questions or simply engage them with a raised eyebrow. Everything is magnified in such close quarters. Something large and full of energy seems even larger, but at the same time the smallest, subtlest thing can be gently shared and still clearly seen. This particular concert is a fund-raiser for my upcoming trip to tell stories in Ireland. So, the program will be bursting with ancient tales from Ireland, woven together with stories of my own Irish ancestors. Having done several House Concerts now, I’m very much looking forward to this one! Do get in contact if you are interested in hosting one yourself. Image: Niki na Meadhra telling stories with Clare Coburn, at Enchanted Evening, in the Bishop’s Parlour at Abbotsford Convent. Photo c. Charlie Sublet. What if Red Riding Hood ate the wolf? When I drew this picture of Little Red Riding Hood digesting the wolf, I really enjoyed turning the traditional story upside down! It felt rebellious and cathartic. It is important to me that this is an ordinary girl, not a ‘warrior-woman’ type that seems increasingly popular. Depending on what day of the week it is, the wolf symbolizes many different things for me. Some days it would feel sacrilegious to devour such a potent archetype. Some days I want to light a candle and pay homage to the wolf. It depends on which version of the tale you read and how you read it. The dark archetypes, which sometimes seem to only destroy, also serve us. On this occasion, eating the wolf felt like an action of consciously digesting fear – beginning the process of breaking it down with the acids in my belly and thereby becoming bigger than it. I always consider fear an ally – when it knows its place. Like fire, fear is a good servant, but a poor boss. Planning my journey to Ireland has raised all kinds of fear for me. It is a bold adventure that requires courage. It is good to have got to a place where I am digesting this and feeling bigger than my fear. Of course, tomorrow is a new day and I don’t expect that every day I will feel on top of it. But today – I feel bold and brave and the wolf makes a good lunch! Preparing for storytelling in Ireland. It’s 40 days now until I fly to Ireland – and I couldn’t be more excited! I’ve been invited to tell stories, in Kerry, at Sneem Storytelling Festival, and will also be performing in Cork and Waterford. My last visit to Ireland, in 2008, had a powerful impact on me as a person, an artist and especially as a storyteller. It was my first time in the land of my Irish ancestors and I totally fell in love with the place and its people. As I traveled I collected many tales and came home with a swag of myths and legends to look up and research in more depth. The mysterious and powerful crone, Cailleach Bheara, who I was introduced to in the small town of Eyeries, in West Cork, has been the central figure of much of my storytelling and art making ever since. Many audiences here in Melbourne have enjoyed her stories. On this trip I will be doing a course investigating her further, led by Dr. Sharon Blackie, in a circle of creative women who are just as fascinated with her tradition as I am. Last time, it seemed some of the Good Folk, or perhaps a Guardian Angel, led me around the country-side creating all kinds of adventures and introducing me to an array of wonderful people. I could not tell you how many times I thought I was lost, but was helped all long by friendly people wherever I went. I do hope the Good Folk will come along this time – a little faerie magic offers protection and ensures the craic will be very, very good!